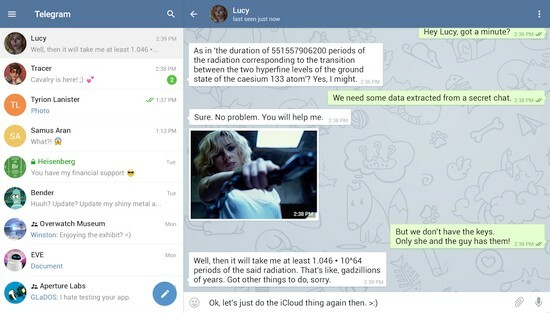 Telegram 1.6.0 Final Portable » SoftLab-Portable.com - Portable Soft! Groups with unread mentions and replies are now marked with an ‘@’ badge in the chats list. Navigate new mentions and replies in a group using the new ‘@’ button. Add an official sticker set for your group which all members will be able to use while chatting in your group (100+ member groups only). Send **bold** and __italic__ text in your messages. Get a share link for posts in public supergroups. Quickly share posts from channels and media messages from bots. Search large supergroup members by name. Search channel members by name for admins. Use search in the service actions log. Ban supergroup members via the right click menu in the service actions log. Check the new event log to see all service actions taken by members and admins of a channel or supergroup in the last 48 hours. Toggle night mode in the main menu.